At the Microsoft Store you can now get a great deal for your Lumia 635, Lumia 1020 and Lumia 1520. The Lumia 635 Accessories Bundle (and those for the 1020 and 1520) brings you a case of your choice, a screen protector and a Microsoft DC-21 portable power pack for $60. On the Lumia 635, that’s a savings of over $38 if you were to buy them separately while on the Lumia 1020 Accessory Bundle the savings could be as high as $70. 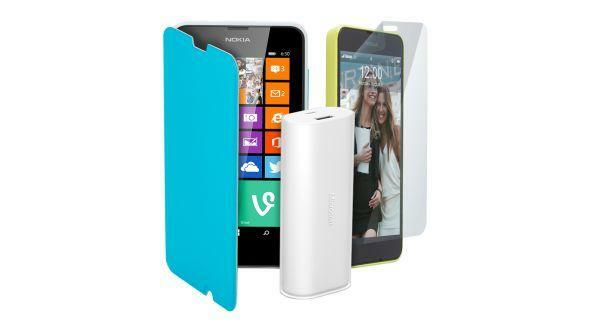 the Lumia 1020 you can get the popular Camera handle case as part of your bundle if you chose to do so. In addition to the case you get a screen protector for your Lumia along with either the DC-19 or DC-21 power pack to keep your Windows Phone charged while on-the-go. These are some great values and a great way to protect your Lumia without spending a fortune. All of these bundles are available directly from the Microsoft store online and of course come with free shipping, a staple of the Microsoft Store. Oh, and you HTC One M8 Windows Phone users don’t feel left out. There is an accessories bundle for you too and it includes the Dot View case. Your savings on the bundle can be up to $44.